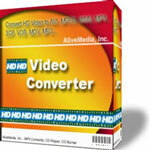 Convert various video to AVI, DivX, XviD, MPEG, MOV, ASF, WMV, MPEG/DVD/ VCD/SVCD, VOB, AC3, AAC or MP3 format. 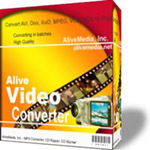 Alive Video Converter is an all-in-one video converter to convert video files from one format to another, and extract audio tracks from video. It allows you to convert all popular video to AVI, DivX, XviD, DVD, SVCD, VCD, MPEG-1, MPEG-2, WMV, ASF, MOV, MP4, PSP, iPod, Zune, 3GP, 3G2, VOB, AC3, AAC, M4A or MP3 formats. With a very easy to use interface you can also extract audio tracks from video files and save them as MP3 format. Alive Video Converter integrated with Windows Explorer is very simple and easy to use. Just right-click on video files in Windows Explorer, select Convert to AVI (or MPEG, PSP, iPod, Zune, WMV, MP4, 3GP...), and convert them using your predefined settings. 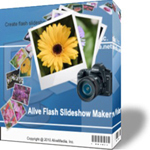 Alive Flash Slideshow Maker is a professional slideshow builder to easily create high-impact photo slideshows. It turns your digital photos to flash ( SWF ) slideshow with background music and transition effects. So that you can upload the output flash file to websites and share your memorial moments with your family and friends. You can also post the flash slide show on on MySpace, facebook, YouTube, or your Blog. With this extremely easy to use flash slideshow maker, You don't need to learn any additional skills to make a flash slideshow. Simply drag & drop the photos into Alive Flash Slideshow Maker, click "Publish" and a stunning flash slide show will be generated. Alive HD Video Converter is a powerful video converter that lets you convert HD video including m2t, m2ts AVCHD video to popular PC video formats which can be supported by Microsoft?Movie Maker, Windows?Media Player or Adobe?Premiere Pro. Alive HD Video Converter converts your HD video files to AVI, MPEG, WMV, DivX, Xvid, MP4, PSP, iPod/iPhone, Zune, 3GP and MP3 format. Convert DVD to AVI, DivX, or XviD, MPEG-1/VCD, MPEG-2/SVCD formats. Convert VOB to MPEG-1/VCD, MPEG-2/SVCD, AVI, DivX, or XviD formats. Alive DVD Ripper is an professional dvd-ripper software to convert your favorite DVD movies to popular video formats, which include MPEG-1, MPEG-2, DVD/VCD/SVCD, AVI, DivX, XviD, MS MPEG-4, Cinepak. With a very easy to use interface you can also convert VOB, MPEG files into above formats. Alive DVD Ripper supports NTSC and PAL, and exports excellent video and audio quality. In addition, the intuitive interface makes Alive DVD Ripper the perfect tool for both new and experienced users. It supports batch file converting, and automatically shutdown computer after ripping done. Alive DVD Ripper gives also you the ability to change different subtitle and language from DVD, and alters with volume and width*height adjusting, and full conversion options. Convert various video to MP4, or convert MP4 to other video formats! Alive MP4 Converter is all-in-one video converter to convert popular video formats to MP4 (MPEG4), or convert MP4 to other video formats including MPEG-1, MPEG-2, AVI, DivX, XviD or WMV. It supports all popular video formats, such as DivX, XviD, MPEG, MOV, QickTime, 3GP, MOD, VOB, WMV, ASF, AVI to MP4. With Alive MP4 Converter, you can also convert your video to Archos, iRiver, Creative Zen Vision, Sandisk Sansa and so on. This utility lets you convert various video to MP3 file as well. Convert various video formats to the iPod video format! Alive iPod Video Converter is a professional ipod video software to convert your regular PC video files (avi, mpeg, divx, etc) into the proper video format that your iPod understands. It can convert AVI, MPEG, DivX, XviD, ASF, WMV, MOV, QickTime, VOB, MOD, MP4 to iPod video, such as AVI to iPod, MPEG to iPod, VOB to iPod. In addition, The intuitive interface makes Alive iPod Video Converter the perfect tool for both new and experienced users. It gives advanced users the ability to finish the conversion with command line or schedule in batches, and supports drag-drop to load or add video files, conversion with width*height, video size, bit rate, and frame rate adjusting. The output ipod videos fix iPod screen! 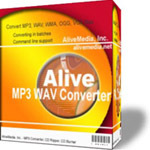 Convert MP3, WAV, WMA, OGG and VOX files from one to another! 1. How to convert video to iPod format? 2. How to convert video to 3GP format for mobile phone and PDA? 3. How to convert video to PSP? 4. How to convert your video to Zune MP4 format? 5. How to convert your video to Flash FLV or SWF format? 6. How to convert DVD to AVI, DivX, XviD? 7. How to convert video to MP3? 8. How to convert video to MP4 format? Copyright(C)2003-2012 AliveMedia, Inc., All Rights Reserved Protected by the copyright laws by international treaties.